At 2.15pm this afternoon in courtroom No. 1 the Chief Justice of Belize, Kenneth A. Benjamin entered the packed courtroom which was standing room only, with many members of the PUP, the media and other concerned Belizeans. After a 40 minute explanation of his decision, the Chief Justice gave his decision about the claim brought before the court by several PUP claimants, which was represented by senior counsel Eamon Courtenay. The Chief Justice granted the claimants request for an injunction to the ICJ Referendum that is scheduled for April 10th. In his decision presentation the Chief Justice referenced several other cases, including territorial disputes and judicial rulings, including rulings in the European Union, Slovenia and the Caribbean Court Of Justice. The main argument made by the claimants was that the Government was not empowered to enter into a Special Agreement in December, 2008. Although, during the presentation of his decision the Chief Justice declares the power of the Executive (ie: the government) to enter into referendum agreements. What is alarmingly uncertain is that no other date was declared for the referendum to be held, or to indicate a timeline for the challenge to the governments executive power to be heard at a later date. In the Courtroom and on the street outside the court the PUP supporters and attorneys were jubilant and shouted in approval when the statement granting the injunction was announced by the Chief Justice. The uncertainty of what happens next is a sea of unknown possibilities or a Chasm to nowhere, and the legal tug-a-war seems to have just began. 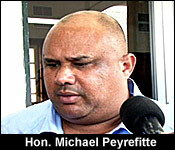 Shortly after the news broke of the injunction, Prime Minister Dean Barrow said that the war is far from ended. While he was quite clear in stating that he is extremely disappointed with the decision of Chief Justice Kenneth Benjamin, Barrow also pointed out that they are in the process of taking three measured steps to ensure that there will be a Referendum on April 10th. It's only 6 days to April 10th. And everyone wants to know what will happen with the referendum - will it go through, or will it be postponed? Tonight, there are still no clear or easy answers - but there is new information. First, for the background: yesterday, the Chief Justice stunned the government when he granted the PUP an injunction against the ICJ referendum. It looked like a slam dunk for the opposition, but as you saw yesterday, Prime Minister Dean Barrow quickly called a press conference to say he's determined to see it happen - one way or the other - while respecting the court. Tonight, the plan on how they hope to do that is becoming more clear - even as the possible outcome is still very much uncertain. The Attorney General's staff has come up with several options to get around the injunction. The first course of action being considered was to go back before the Chief Justice with an application to adjust - or vary - his ruling. The idea would be to go ahead with the referendum, but it would not be finalized until the Chief Elections Officer, Josephine Tamai, certifies it. In that way, the referendum's results would be frozen until the PUP lawsuit is heard to completion and disposed of. The other option is to just go straight to the Court of Appeal for an emergency hearing and attempt to convince the panel of judges there to lift the Supreme Court injunction. Well, 7News has confirmed with multiple sources, that the Barrow Administration has decided to go with that option. We are told that the Crown Counsels from the AG's Ministry worked late into the night to prepare the documents so that a prompt filing at the Appeal Court could take place before 10 this morning. Those documents have been filed, and it is now in the hands of the Appeal judges to decide on a date for what the government hopes is a very urgent hearing. "We plan on appealing the decision, so I don't want to comment on the details of it until the matter has been completed and the process has been drawn to its conclusion in the courts." "Were you at all prepare for such an outcome today?" "Absolutely. I've already signed the appeal forms and those will go in no later than tomorrow morning and hopefully we can get a hearing before the court of appeal before April 10th." 'What do you make of the fact that now that this injunction is in place, it could take months or years before an actually referendum takes place since this case has to go to completion first?" "The People's United Party would have to explain that to the people. They decided to challenge the holding of the referendum on April 10th. If it gets delayed because of this years and years to come, then that's a question for the PUP." "Having heard the position of the chief justice as you sat in there, do you grasps the points that he was making?" "I heard what he was saying. I respect what he said, but I totally disagree." "What's happens now? Does preparation still continue as schedule until the outcome of tomorrow?" "We have to. We understand fully well that the court of appeal may hear this matter before April 10th. We have to continue as we were and hope that we can get a date before the court of appeal and we have to continue, because the court of appeal may very well reverse what the chief justice said. We don't know. They may affirm what he said, and then we have to make preparations for some time down the road until the matter is fully ventilated, or we may have to make preparations for the fact that the court of appeal could say that the chief justice was wrong and then we proceed with the referendum on April 10th." The Government still hopes to meet the April 10th deadline, and so that emergency Court of Appeal hearing could take place almost immediately. So what will happen next? A few minutes ago, governemnt sent out a release laying out what it hopes is a best case scenario. "The Chief Justice's injunction ruling means that the April 10th referendum is to be postponed until a further order of the Court. The Government of Belize (GOB), however, is appealing the decision of the Chief Justice and asking the Court of Appeal to overrule that decision so that the referendum can still take place on April 10th. GOB is asking the Court of Appeal for an expedited hearing with the hope of having the appeal heard by Monday, April 8th. If the Court of Appeal agrees to hear the case, there may still be a referendum on April 10th depending on the outcome. If the Court of Appeal ruling comes out before April 10th and reverses the Chief Justice's ruling, the referendum will proceed. The Court of Appeal can discharge the injunction, in which case the referendum would proceed. The referendum will only remain delayed if the ruling comes out before April 10th and upholds the injunction. Since the only issue the Court of Appeal may find is that the procedures to announce the referendum were not fully proper as per procedural technicalities, the referendum would not be cancelled or deferred to another year. It is the view of the GOB that a worst-case scenario is that there may have to be a Meeting of the House of Representatives to ensure that all the technicalities are done properly. In that event, the referendum would be delayed for no more six to eight weeks." So there you have it, what government hopes is the best case scenario. We'll keep following it closely, to tell you whether next week's Referendum is a go or no go. Will Court of Appeal Hear Injunction Case this Weekend? II. A technical point, that the Writ of Referendum (formal written order) was not done properly as per the Referendum Act. I. The 2008 Special Agreement is valid because it was properly executed. The Chief Justice rejected this substantial point. II. However, the Chief Justice agreed that a technical point, as to the validity of the Writ of Referendum, is a serious issue that should be tried and, therefore, granted an interim injunction until trial of this technical point.